It has been announced today that after two years of MotoGP using the new Silverstone ‘Wing’ Pit & Paddock complex the elite motorcycle series will return to the old National set up for this years Grand Prix. Silverstone claim that customer feedback has shown that two wheel fans prefer to get closer to the race action whilst at the same time being able to experience entertainment, retail stands and manufacturer displays. The retail and entertainment area is within walking distance to the National Paddock however to the ‘Wing’, the walk is so long Silverstone have to put on a bus service. In previous years, MotoGP has operated out of two paddocks as the ‘Wing’ complex is not big enough to accommodate all classes and this has proved logistically challenging for Dorna. In 2011 MotoGP was one of the first events run out of the new ‘Wing’ complex. However it is not the only large scale motorcycle event to run out of the old paddock, Stuart Higgs announced in 2011 that BSB wouldn’t even move to the new paddock as it was too expensive and too small. Although it is understood that the MotoGP decision has been taken by Silverstone rather than Dorna. With change of paddock comes change of the start/finish straight, the MotoGP bikes will now start and end on the National Pits straight, with Copse being the first corner and Woodcote being the last. Fans who have already bought tickets for Abbey Grandstand thinking it would be the first corner will have the option to change at no extra cost. 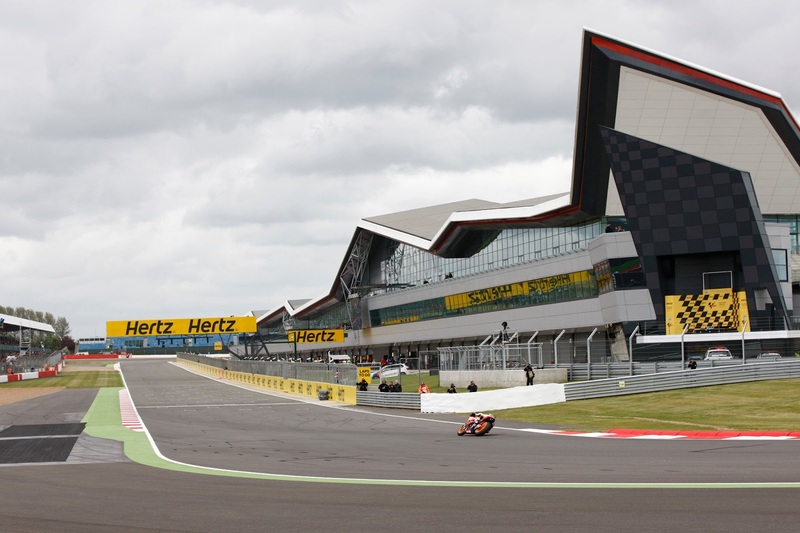 Dorna bigwig Carmelo Ezpeleta said: “From Dorna’s point of view we understand the decision taken by Silverstone for the 2013 British Grand Prix, to be held at the beginning of September. Whilst working out of the prestigious Wing, which opened in 2011, allowed us to enjoy the comforts of a modern, first-class building, going back to the National Paddock will help concentrate our entire global organization in one place, which, logistically, is always highly beneficial. What is clear is that the Grand Prix will be one of the highlights on the calendar under the watchful eyes of thousands of fans”. Only good thing about it is less waiting for buses to get from one part to the other. How many laps will it be on that circuit? Could be good as we would see more of them as they would come past more often! Makes me a happy bunny! I bought MotoGP Paddock Passes & Hospitality at the CJ Riders Fund auction last October. These will probably be with a Moto2 team in the National Paddock and up to now I thought the MotoGP teams would be at the Wing. Now it seems they will all be together! Don't think you'll see the bikes more often. As I understand the article, they will use the same circuit configuration but just start/finish from a different place. What difference does it make to me? I go to watch the racing not look at the architecture. Believe the Start and Finish Line will be still in the same place though. Next Next post: Moto3 Valencia Test: Day 3 roundup.